The planet Venus – the most brilliant celestial object after the sun and moon – is getting brighter day by day in the November predawn sky. This dazzling world was in our evening sky earlier this year. However, it recently passed between earth and the sun, so that it now rises about 3 hours before sunrise as seen from mid-northern latitudes. Moreover, at middle latitudes south of the equator, Venus rises less than 2 hours before sunrise. Everywhere around the globe now, people can see blazing Venus lighting up the eastern sky before dawn. Our sky chart shows the November predawn sky as viewed from mid-northern latitudes. In that dark hour, you will see the blue-white star Spica and the golden planet Saturn to the upper right of Venus. 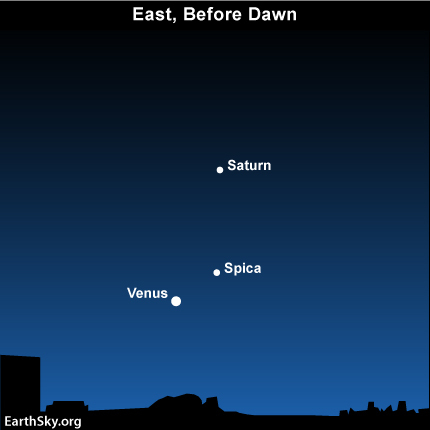 Although Spica and Saturn are of first-magnitude brightness, they pale next to Venus. 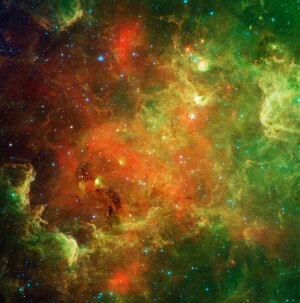 This brilliant beauty shines well over 150 times more brightly than either Spica or Saturn. After the morning twilight washes Spica and Saturn from the blackboard of night, Venus will still be beaming away in the glare of dawn. In fact, keen-eyed people will still see Venus after sunrise. Watch for Venus to brighten by the day and to shine at its greatest brilliance in early December! On December 2, the waning crescent moon will pair up with Venus to paint an early morning tableau that you will not want to miss. Mark your calendar now. A few days afterward, the moon will drop out of the morning sky. Then you might even see Venus casting a shadow before dawn, especially if your terrain is light colored – for example, covered over by snow or white sand. Previous Story: Health Insurance, what will happen? Site contents copyright © 2019 Recorder Online	except as noted. All rights reserved. | 83 queries in 1.277 seconds.